The National Nuclear Security Administration's National Ignition Facility (NIF) has set world records for neutron yield from laser-driven fusion fuel capsules and laser energy delivered to inertial confinement fusion (ICF) targets. The neutron yield record was set on Sunday, Oct. 31, when the NIF team fired 121 kilojoules of ultraviolet laser light into a glass target filled with deuterium and tritium (DT) gas. The shot produced approximately 3 x 1014 (300 trillion) neutrons, the highest neutron yield to date by an inertial confinement fusion facility. Neutrons are produced when the nuclei of deuterium and tritium (isotopes of hydrogen) fuse, creating a helium nucleus and releasing a high-energy neutron. On Tuesday, Nov. 2, the team fired 1.3 megajoules of ultraviolet light into a cryogenically cooled cylinder called a hohlraum containing a surrogate fusion target known as a symmetry capsule, or symcap. This was the highest-energy laser shot and was the first test of hohlraum temperature and capsule symmetry under conditions designed to produce fusion ignition and energy gain. Preliminary analysis indicated that the hohlraum absorbed nearly 90 percent of the laser power and reached a peak radiation temperature of 300 electron volts (about six million degrees Fahrenheit) -- making this the highest X-ray drive energy ever achieved in an indirect drive ignition target. The experiments followed closely on the heels of NIF's first integrated ignition experiment on Sept. 29, which demonstrated the integration of the complex systems required for an ignition campaign including a target physics design, the laser, target fabrication, cryogenic fuel layering and target positioning, target diagnostics, control and data systems, and tritium handling and personnel and environmental protection systems. 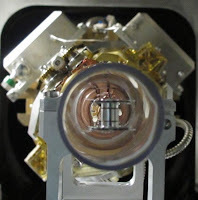 In that shot, one megajoule of ultraviolet laser energy was fired into a cryogenically layered capsule filled with a mixture of tritium, hydrogen and deuterium (THD), tailored to enable the most comprehensive physics results. "The results of all of these experiments are extremely encouraging," said NIF Director Ed Moses, "and they give us great confidence that we will be able to achieve ignition conditions in deuterium-tritium fusion targets." NIF, the world's largest and highest-energy laser system, is located at Lawrence Livermore National Laboratory (LLNL) in California. NIF researchers are currently conducting a series of "tuning" shots to determine the optimal target design and laser parameters for high-energy ignition experiments with fusion fuel in the coming months. When NIF's 192 powerful lasers fire, more than one million joules of ultraviolet energy are focused into the ends of the pencil-eraser-sized hohlraum, a technique known as "indirect drive." The laser irradiation generates a uniform bath of X-rays inside the hohlraum that causes the hydrogen fuel in the target capsule to implode symmetrically, resulting in a controlled thermonuclear fusion reaction. The reaction happens so quickly, in just a few billionths of a second, that the fuel's inertia prevents it from blowing apart before fusion "burn" spreads through the capsule -- hence the term inertial confinement fusion. In ignition experiments, more energy will be released than the amount of laser energy required to initiate the reaction, a condition known as energy gain. NIF researchers expect to achieve a self-sustaining fusion burn reaction with energy gain within the next two years. The experimental program to achieve fusion and energy gain, known as the National Ignition Campaign, is a partnership among LLNL, Los Alamos National Laboratory, the Laboratory for Laser Energetics at the University of Rochester, General Atomics of San Diego, Calif., Sandia National Laboratories, Massachusetts Institute of Technology, and other national and international partners. In the Oct. 31 "neutron calibration" shot, NIF's lasers were fired directly onto a DT-filled glass target, as opposed to the indirect-drive geometry used in NIF's TD and THD experiments. The purpose of the shot was to calibrate and test the performance of NIF's extensive neutron diagnostic equipment. The capsule used in the Nov. 2 symcap experiment has the same two-millimeter outer diameter doped shell as an ignition capsule, but replaces the DT fuel layer with an equivalent mass of material from the outer shell to mimic the capsule's hydrodynamic behavior. Achieving a highly symmetrical compression of the fuel capsule is a key requirement for NIF to achieve its goal of fusion ignition.